Can you review H2o again, now that they have LTE. I am curious to see a speed test. I think it will be a while before I get around to reviewing H20 Wireless again. I have a few other reviews I want to do first. But, I think I can share a little information with you that might help you decide if H20 Wireless is right for you. 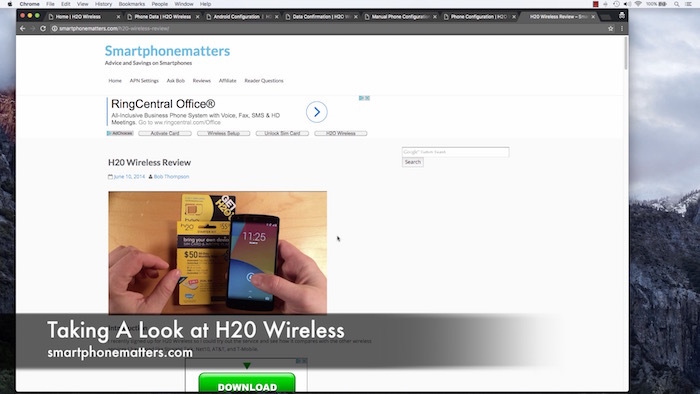 Back in Jun 2014 I reviewed H20 Wireless. For those of you who didn’t see my 2014 review, H20 Wireless is a prepaid wireless service that uses the AT&T network. I found that there were reasons I wouldn’t use the service myself. Back then H20 did not offer 4G LTE data on their network. Back then H20 Wireless only offered 4G or high speed HSPA+ and not 4G LTE so data speeds were not as fast and other wireless companies that were offering 4G LTE service on the AT&T network. Next, I was unable to set up my iPhone to be able to use MMS picture messages and group texts. Some of you may know that when you use any AT&T network SIM in the iPhone, the phone will automatically set the APN settings, and hide the Cellular Data Network page in settings so you cannot view or change them. This would be fine except the phone would set up the APN settings for AT&T wireless, not H20 Wireless using the AT&T network. Because of this, the your cellular data and MMS will not work and there is no way do edit the APN settings. You are able to get data working because on the iPhone you can install an APN carrier profile that will set the data APN but not the MMS settings. I was able to set up MMS on my Nexus 5 at the time. Now, to address your question about H20 speedtest results now that they support 4G LTE. While I haven’t tried it, I’d expect to see the speeds to be the same as you would see with any other prepaid wireless service using the AT&T network. As far as I know, Cricket Wireless, is the only prepaid wireless company that restricts the speeds on their AT&T 4G LTE network. (to 8Mbps max). I suspect that’s because they are owned by AT&T, and they want to make sure tat AT&T postpaid and AT&T prepaid GoPhone service remain competitive. You did not mention what type of phone you are using, but I’d be concerned about setting up MMS if you are using an iPhone. I took a look around h20wireless.com and as far as I can tell, the service still requires installing an Carrier APN profile. They setup page specifically says that this will only set up data, not MMS. If you are using an Android phone you should have no problem with MMS. I was able to find the APN settings on H20wireless.com so you should be able to set them up. I took a little time to review the plans and features H20wireless.com and I liked some of the plans. They have an unlimited talk and text plan with 5GB of 4G LTE data for $50 and unlimited 6GB plan for $60 dollars. These prices are discounted to $45 and $54 when you sign up for Auto Refill. With Auto Refill, you let H20 Wireless charge your credit card each month of service. The 6GB plan isn’t competitive with other services and the $50 plan ($45 with Auto Refill) is pretty standard. However, I do really like the unlimited 1GB plan for $30 and the unlimited 3GB plan for $40 dollars. Even better, with Auto Refill, these plans are discounted to $27 and $36. I like the price points here for people who want unlimited talk and some data. It looks like H20 Wireless is giving new customers an extra 1GB of 4G LTE data for the first three months. Even better, I found out that H20 Wireless supports Roll Over Data. If you don’t use all your 4G LTE data in a month, it carries over. You can carry up to 5GB of 4G LTE. To me, this makes the 1GB plan really attractive for people with modest data needs because you can carry months of data at any given time. Check out my video below.